Part of the learning curve for an expat moving to live in Silicon Valley can be getting used to driving here. Outside of San Francisco, not driving is not really an option. Even San Jose, the capital of Silicon Valley, has limited public transport options, given the distances involved. Besides commuting and other necessities, it is a huge pleasure to drive in the sunshine and explore this beautiful area. In about an hour you can be strolling the Santa Cruz boardwalk, sipping wines in a vineyard or stepping back in time in San Juan Bautista. So how is driving in Silicon Valley different from Ireland and the UK? This is great. If safe to do so, you can turn right when you have a red light, unless expressly forbidden (indicated by a red arrow). A great time saver. Obvs. If you haven’t done it before it takes a little getting used to, but it’s not really difficult to adapt, as your steering wheel is also on the wrong side of the car, so the driver is still safely in the middle of the road. In Ireland, if you have a green light, the pedestrian crossings in your path have red lights. Here, you can have a green light and encounter a pedestrian crossing with green (well, white) light. One to watch out for. As much as I love turning right on red, I miss roundabouts. Instead of roundabouts, you have 2- 3- 4- or 5-way stops, where you stop and then continue in order of arrival at the junction. It’s not always clear who arrived first and if you hesitate it can be dangerous, so this is my driving bête noire over here. *Well, actually they are, but this is widely ignored for aesthetic reasons. I never realised how great cars can look without front plates. 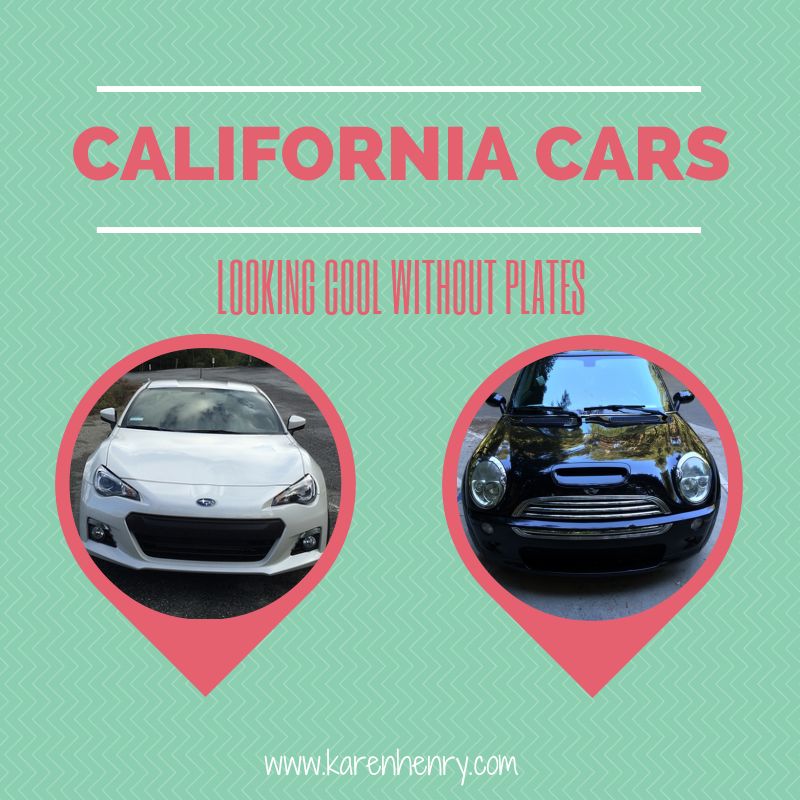 Customised licence plates are popular and cost from $50, you can have fun creating yours online. Timidly entering a freeway where six lanes of traffic are barrelling along at 70mph is not an option, you’ve got to put the foot down and join them. I still find this a bit intimidating at times. “Short merge” is a particularly terrifying term. This is where you can have just a few hundred feet to enter a freeway in the same lane as traffic is exiting. Another great aspect to driving here. When traffic is heavy, access to freeways is controlled in places by traffic lights, one or two cars per green, so it’s easier to merge. Speaking of merging into freeways, this can happen a lot on the shortest journey, if you follow your sat nav default directions. Unlike in Ireland, where the motorway system radiates out from the capital and generally goes around, under or stops before city centres, freeways weave through city centres here. So if you were going from the San Jose equivalent of Ranelagh to Portobello, you would do so via the M50. It was a happy day that we discovered the ‘ avoid freeways’ option on the sat nav, avoiding spells on several freeways for short journeys. Cars are much cheaper to buy here, just remember that like everything else, sales tax is payable on the quoted price. It’s OK to forget to budget for 8% on a $20 shirt, but it’s a different story for a $20,000 car. There are other small fees and taxes to pay (DMV calculator), but nothing like Irish road tax. Petrol (gas) is available in regular, super-regular and premium and you can fill up a standard car with premium for less than $40 (€30). Until I became the smug holder of a California driving licence, there was always consternation when presenting ID, which is often required for credit card purchases. Passports are so cumbersome, not to mention too precious to carry around and if you have the old style pink paper Irish driving licence, well, you can imagine how that looks. 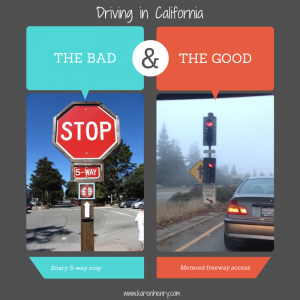 So there you have it, some of the differences we have found between driving in California and in Ireland. Like everything else, some things are worse, some better. It’s the difference that makes it interesting. Do you have any international driving stories to share? I’d love to hear about them in the comments below. Interesting observations Padraig. I agree, we are so familiar with the USA through TV and movies that we don’t expect so many differences.